Okay real talk. The Oregon Coast is one of my favorite places in the world, and Cape Kiwanda is the jewel of it. When Ashley reached out about looking for a photographer for an adventure session, I was MEGA pumped. Cape Kiwanda has been on my shooting bucket list for as long as I could remember, so it was a blast to be able to make it happen! About 10 minutes out from the coast, it dropped to 60 degrees and there was nothing but thick fog, which isn't ideal when you want to be photographing the vibrant colors of Pacific City! I headed down to Cape Kiwanda to check it out, and was in contact with Ashley and Jason about the situation. They were pretty bummed, but we didn't have many other rescheduling options. They decided to roll with it anyways, and by the time they got there, the fog was starting to clear out more and more! I'm so glad that we went for it because the fog ended up adding a really cool element to their photos, and the fog definitely cleared up some of the crowds! These two are from Pennsylvania, and Ashley and I actually went to the same high school! But they're currently stationed in Depoe Bay because Jason is in the Coast Guard! They got married a few months ago back out in PA, but wanted some photos to document their time spent on the coast, since they might be transferring soon. People typically only think of having photos done for engagements + weddings, but this is a great example of how you can throw in little session to remember different seasons of your lives. Buying a home, anniversary sessions each year, new jobs etc. Celebrate all seasons of life! 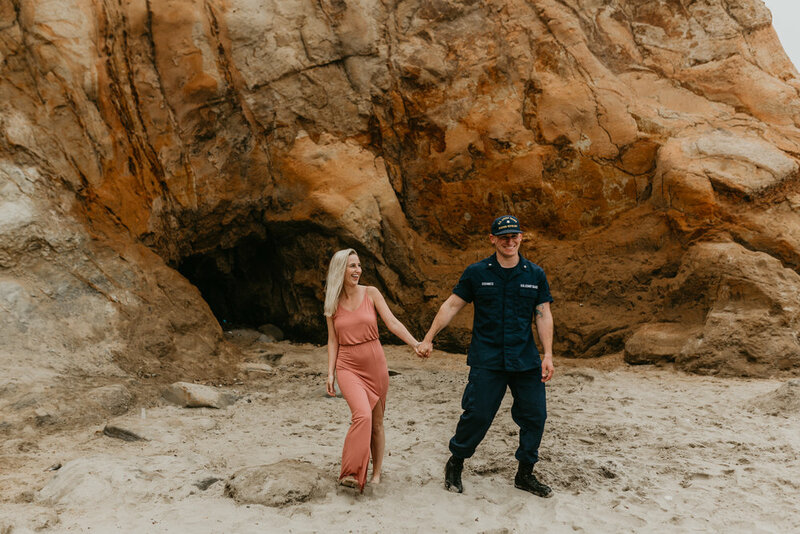 Planing an elopement or engagement session on the Oregon Coast? Cape Kiwanda would be an epic place! Get in touch below and let's start dreamin up!